USTA League Tennis Mixed Doubles 18 & Over is similar to USTA League Tennis in that it offers competitive league tennis play at the local, state and sectional level, culminating in a National Championship featuring the top teams from the USTA's 17 Sections. USTA Southern also offers a Mixed Doubles 40 & Over Leage that is parallel to the Mixed Doubles 18 & Over League and includes advancement to a State and/or Sectional Championship. 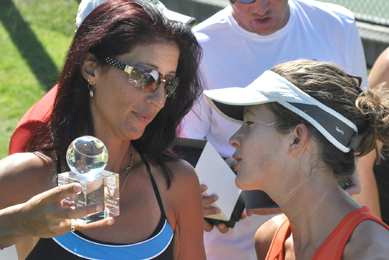 The USTA League Tennis Mixed Doubles program allows players of different NTRP levels to play together, encouraging participants to play with their friends, family and co-workers. Players without a NTRP rating are permitted to self rate. The levels offered include 18 & Over 5.0 - 10.0 and 40 & Over 5.0 - 9.0. The program is open to all players 18 years of age and over. There are currently over 26,000 players participating in the USTA League Tennis Mixed Doubles program in the Southern Section. Competition among the South’s best Mixed Doubles teams in 18 & Over and 40 & Over will run from Friday, Oct. 11 to Sunday, Oct. 13, 2013 in Mobile, Ala.
Congratulations to the champion teams advancing to USTA Southern Mixed Doubles Sectional Championshipsin Macon, Ga. Click here for results of the 2012 USTA League Mixed Southern Sectional Championships. Click here for stories, photos and videos about the teams who competed. Here's the link to our web site: www.southernmixed.com that has complete information.